Phyrexian Obliterator: Not actually all that great in EDH, but probably fits the bill as a "big" beater. Certainly looks and sounds intimidating. In terms of mana base, is there a reason you're playing so many Plains? Since your deck isn't biased towards white, you could balance out the basic lands unless you plan to run Emeria Shepherd. You're also missing Temple of Triumph. Clifftop Retreat, Isolated Chapel, and Woodland Cemetery would also be helpful to complete the cycle. Take out Boros Garrison and Rakdos Guildgate. 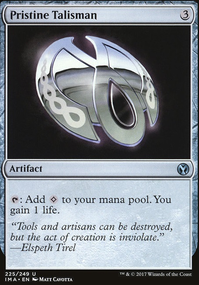 You could cut Ash Barrens since you don't need colorless mana. Rampant Growth would be a better replacement. Archangel of Thune grows all your creatures by a lot with Ikra's ability. You could try Goldnight Castigator for a flying high toughness creature. The new Evra, Halcyon Witness is pretty powerful if you're gaining lots of life. Malignus can be pretty big too. I'm not sure Zacama synergizes that much with your gameplan considering the mana cost. If you want big dinosaurs, Zetalpa, Primal Dawn would probably be good for this deck. Maybe Verdant Sun's Avatar. Well of Lost Dreams seems mana-heavy for card draw. Rishkar's Expertise might not be very reliable with your creatures. You could try Tymna the Weaver, Promise of Power, Soul of the Harvest, Kothophed, Soul Hoarder, Baleful Force. Necropotence of course would be amazing since you're gaining so much life. 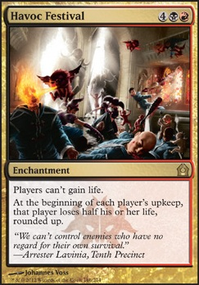 You might as well add in Exquisite Blood for more lifegain and the potential combo with Sanguine Bond. You could cut Solemnity, Erebos, Vizier of the Menagerie, Deathrite Shaman, and Blind Obedience. You want boardwipes that synergize with your deck by killing smaller creatures. Stuff like Languish, Hour of Devastation, or Subterranean Tremors. Journey to Eternity Flip could be good for recursion. Really like the Horobi interactions you've included throughout the deck. 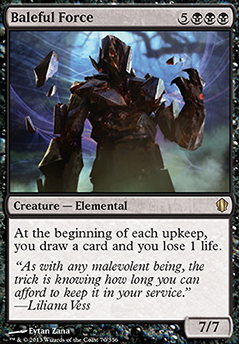 Tetzimoc, Primal Death is a useful one you can keep in your hand to destroy creatures for 1 mana. Sacred Armory doesn't seem very mana-efficient. If you can clear the board, Phage the Untouchable is a good wincon. Colossus of Akros and Elbrus, the Binding Blade Flip could be big tramplers. Ob Nixilis, Unshackled should get pretty big as well. Overseer of the Damned and Army of the Damned could be useful to make zombie armies. Veilstone Amulet might not help much because your creatures die once they get targeted, even if you make them hexproof. You also don't have many instants to preemptively trigger it. Eldrazi Monument and Soul of New Phyrexia could be helpful to keep your creatures alive. Baleful Force is great for card draw if you can keep it alive. Promise of Power is another good draw spell. Staff of Nin seems a bit overpriced for the effect. 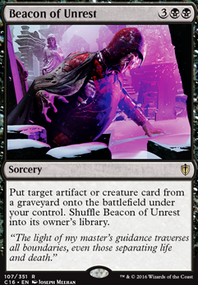 Kormus Bell allows you to destroy all your opponents' lands if someone plays an Urborg. You probably have enough removal that you can drop Reiver Demon. Someone made a post on the cedh reddit about trying to make a Jarad list, they were new and weren't actually looking for a cedh list, but I linked them to the Jarad list we currently have to give them ideas as they seemed inclined to spend between $300-500 on a deck and it would be easy to make budget jarad. However after looking over both the primer and the list, I think it's pretty outdated. I don't think that specific list should have Jarad at tier 2, and the primer needs an update as it mentions partial paris mulligans (which no one allows anymore). It's running just odd/bad stuff like Baleful Force, Scorned Villager Flip, Temple of Malady, 4 basic forests (in a hermit druid list??? ), Tempt with Discovery, Frontier Siege, some other stuff. Just feels like it could use an update. Especially those 5 lands. Maybe just copy the land base from the Gitrog primer without the 2 swamps/2 forests? Dragonlair Spider and Dragon Broodmother are another couple of good ones. I remember Baleful Force being a house. 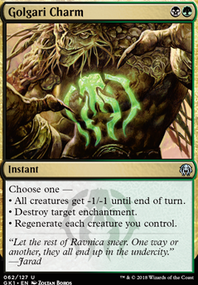 Basically a great blocker who refills your hand for the next turns creature spamming. Reiver Demon was great for clearing the board. I found it to be more effective than I initially thought it would be and would work well with an artifact theme. War Cadence also great for preventing blocks to end it all quick cause you're racing board wipes. That's some of what I can remember off the top of my head. Emzed on Let's Go(nti) and steal some cards! High Market and Myriad Landscape are two great lands for this archetype, i can really recommend them. 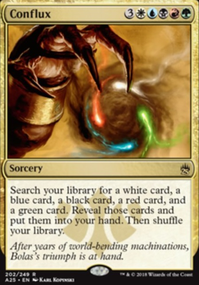 Personally, when playing black EDH decks, i was suprised how often removal restictions like "destroy a nonblack creature" hurt me, and therefore i try to really limit the number of those restrictions to the bare minimum. Based on that, i suggest you replace Nekrataal with Noxious Gearhulk since that doesn't care what you want to kill, and gains you some life as well. Since you have a minor reanimation theme going on, Baleful Force might be useful for you. That guy just draws a huge amount of cards over a few turns. 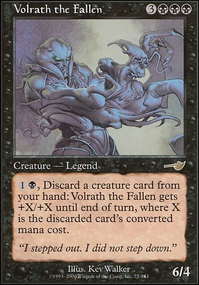 I have had some really good experiences with Faceless Butcher, often used to exile my own creature to reuse ETB triggers or return it after it was stolen by Treachery, Bribery or Animate Dead.